Best of IFA 2013: Top 10 new products | What Hi-Fi? This week on whathifi.com was dominated by Europe's biggest consumer show, IFA 2013. 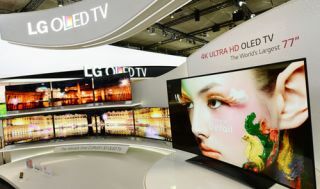 Berlin was the epicentre of new product launches as the likes of LG, Panasonic, Sony and Samsung came to parade their newest and shiniest products at the show. TVs were the major talking point this year with the usual suspects bringing monster 4K Ultra HD TVs to the showfloor, alongside curved TVs, OLED TVs and more besides. The home cinema landscape shone with soundbars of all shapes and sizes – and an emerging trend of speakers that sit directly underneath your TV – and surround systems, too. But hi-fi wasn't left out – far from it – with plenty of good news for those of us who care about sound quality, thanks to a raft of new products announced that support high resolution audio files, most notably from Sony. Sony sprung a surprise at IFA by launching a full family of high resolution audio products complete with a hi-res audio "gateway" online to guide you to HD music download sites. The new Sony hi-res range is made up of the HAP-Z1ES HDD audio player, the TA-A1ES stereo amplifier, HAP-S1 compact HDD audio system, UDA-1 USB DAC amplifier and SS-HA1 and SS-HA3 bookshelf speakers. The flagship HAP-Z1ES HDD player caught our eye, with a 1TB internal hard drive, and support for AAC, ALAC, AIFF, DSD, FLAC, MP3, WAV and WMA audio codecs. Another year, another great big whopping phone/phablet/whatever from Samsung. The Galaxy Note 3 stands out from the crowd, again, thanks to support for 192kHz/24bit hi-res music. It should be good for movies, too, with a screen that measures in at 5.7in, while there's also a 13MP rear-facing camera, a large 3200mAh battery, Android's Jelly Bean 4.3 operating system and 32GB/64GB storage space. The Note 3 will have two models running two different processors, with a LTE model sporting a 2.3GHz Quad-core processor and a 3G version running a 1.9GHz Octa-core. Receiving plenty of "oohs" and "ahhs" at IFA this year was Philips' PFL9708 TV, the company's first-ever 4K TV. And it's arguably the best-looking UHD TV we've seen. There were plenty of soundbars on show, but Harman Kardon's Sabre SB 35 caught our attention more than others due to the fact... well, just look at it. It's a super-thin "8.1" soundbar system that stands just 1.25in deep. Connectivity includes three HDMI inputs, optical digital and stereo analogue inputs as well as Bluetooth wireless connectivity. All yours for a cool £749. We haven't heard much from the Danish speaker company in a while, so IFA marked something of a return with the announcement of a new wireless speaker. Called the Tangent Classic, it houses aptx Bluetooth and a bass reflex stereo speaker in an oval-shaped cabinet. Simple sounding but the design is superb. IFA saw Sony launch a new version of its venerable music player and it surprised us by being the first Walkman to support hi-res 192kHz/24bit audio files. Part of a new range of Sony hi-res products, the Walkman F886 is powered by Android 4.1, has built-in wi-fi and comes with a 10.2cm LCD screen. Battery life varies with MP3 tracks claiming 35 hours of battery life, while 96kHz/24bit files manage a not too shabby 26 hours. Soundbars have been all the rage for some time, saving us from tinny-sounding TVs if you're not prepared to add a more substantial system. LG has turned out some of the best soundbars if you're on a budget, and now it has debuted a new LG Sound Plate. It's a 4.1-channel system that's 3.5cm tall and is designed to sit under any 32-55in TV. Dual subwoofers have been built in, capable of firing sound in multiple directions with Bluetooth streaming also included. Interesting. We're big fans of the award-winning AKG K550 headphones, so while we're a little teary-eyed at seeing them replaced, we're excited to hear the headphones announced to replace them, the AKG K545. The K545s comes in four colours (black, white, black/turquoise and black/orange), are smaller than the K550s and will offer the choice of two cables with built-in mic capabilities. One will be for Apple devices, and the other a second universal remote for Android, Windows Phone and BlackBerry smartphones. Panasonic took to the stage and unveiled the TX-L65WT600, a 65in 4K TV. Due for release at the end of September it, like many 4K sets, comes with a large price tag. £5,499 to be exact. But hey, it's a Panasonic 4K TV, that's got to be worth getting excited about. What's more, there's an all-important new spec: HDMI 2.0. This is the first TV with the new HDMI 2.0 spec, which is largely designed to ensure 4K video support over HDMI, though there are also plenty of other interesting upgrades to the audio and video capabilities. At a show that's boasted many "world firsts", LG has contributed to the bustling list with the world's first, and therefore largest, curved OLED 4K TV. Got that? Curved, OLED and 4K Ultra HD resolution. Phew: tech-packed. Sure, we wouldn't be holding our breath to see it in stores or even in our test rooms any time soon, but if consumer electronics shows aren't about pushing the boundaries of new technology, then what are they about? We approve.